Up for bid is a NEW antenna developed and handcrafted by Lowbander to bring all band coverage to SWLs at a reasonable price! The biggest advantage of the Super Sloper is that it will fit into almost anyone's yard! It is only 33' long if it was strecthed out horizontally, but since the Super Sloper is slanted or "Sloped" downward from the center insulator, it takes even less space to install and perform at its best! So, less than 33' of real estate is needed to get great, full size antenna performance! Almost anyone can find this much real estate! . Built by one of the most trusted names on Ebay, "Lowbander," this antenna has been cut, tuned and tested, by an experienced ham radio operator with 42 years experience. This DXCC Honor Roll Member, with an FCC Amateur Extra Class License, knows DX and antennas! Lowbander now brings another proven performer to the shortwave listeners of the world! 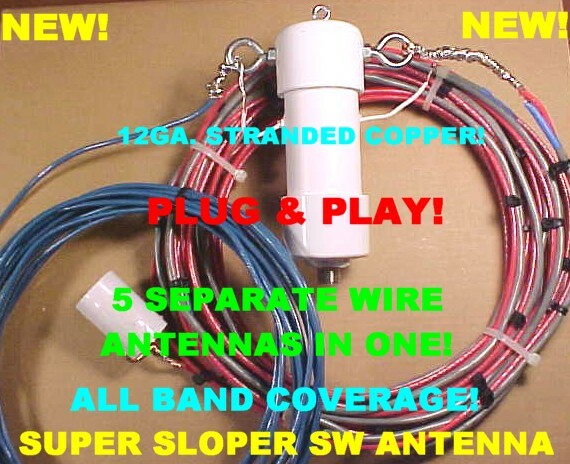 The new Super DX Sloper All Band Antenna is a true, Full Size Half Sloper antenna for all the common shortwave bands! ! THERE ARE NO LOSSEY TRAPS OR COILS LIKE OTHER POPULAR ANTENNAS ADVERTISED ! It is a simple but proven design, 5 full size Slopers, one FOR EACH BAND. A design that ham radio ops have used for decades, this antenna is handcrafted and can be used effectively on all the shortwave bands. The longest wire section which supports the weight of the antenna is made of rugged, pure, multi-wire, stranded insulated12 gauge copper wire. The other antenna sections are made from multi-wire cable, which is weather sealed for years of dependable service. The Super Sloper has been cut and carefully tuned to be resonant on the SWL bands of 41-49 Meters, 31 Meters, 22-25Meters, 16-19 Meters, and 11-13 Meters. Each band has its own antenna wire section and acts as an individual antenna! But the total length of the antenna is a quarter wave on 80 Meters and hears well on the lower and MW frequencies as well. There is a huge capture area to pull in those weak signals from the sky. No lossey baluns or line transformers are needed with this antenna! Since the antenna is resonant , or a perfect match on each band, because there is a separate wire antenna for each frequency range listed above! The antenna is a perfect match for the high quality 50 coax feedline included with the antenna. Each antenna is been tested on the MFJ-259B Antenna Analyzer for resonance. All the buyer has to do is stretch it out and connect the feedline to the radio. The Super Sloper All Band will show some directivity or receive signals best toward the direction it runs down from its support in, but is an excellent receive antenna for signals in all directions because of the vertical ground counterpoise section. If your favorite area of the world to listen to is say Europe, it would be best to point the leg of the antenna in that direction from your home. But dont think it wont hear of the sides or behind it! Because of the vertical section of the ground side of the antenna, the Super Sloper is almost omnidirectional in the reception of low angle signals, like DX stations! This Super Sloper is a proven DX antenna! Hams have used this arrangement because it places the current node of the antenna at the highest point, utilizing maximum radiation and reception. For this reason, the Super Sloper, which is a quarter Wave Sloper, is noted as a killer for low frequency DX! Also, with the feed point at the high point is not subject to attenuation from buildings, trees, etc. as a vertical antenna whose current lobe is at ground level. Since a sloper has an optimized low angle radiation pattern for peak DX performance, it will greatly outperform a dipole mounted at the same height, for those really distant weak signal DX stations. The Super Sloper is designed for ideal installation from 25-45 in height. Lowbander has heard, worked( exchanged signal reports) and confirmed over 280 countries on 40 & 80 Meters with this identical antenna design, but cut for the ham bands! Make sure you understand this antenna up for auction is cut and tuned for the SWL bands! You have to be able to Hear them, before you can work them! The QSL cards are on the wall to prove it , too! This antenna PLAYS! All connections have been carefully soldered and the center insulator has been weather proofed for years of reliable service. There is even a hook or eye bolt on top of the center insulator to support the antenna in the middle. The new Super Sloper All Band Antenna will work with almost any radio in almost any situation! Sony, Realistic, Sangean, Drake, Icom or Grundig, it really doesnt matter, because all these great brands of radios work equally well with the Super Sloper. Even radios that don't have coax sockets can use this antenna with a simple adapter plug available at any Radio Shack! *"FABULOUS ANTENNA ALMOST AS GOOD AS MY 50' TOWER rECOMMEND HIGHLY"
*" Great antenna! Can't believe the difference it made compared to my old longwire!! Two to three S units on my meter!Thanks!" *"Excellent!...just as described...well made SWL signal puller!" *"Thanks for making a quality all band antenna that is affordable and performs!" *"The Super Sloper hears better than my commercial made $100+ antenna!!! Wow, I am impressed! I should have saved my money. Wish some of the reviews in the Shortwave magazines had compared the commercially made units to the Super Sloper!" *"Great value! Thanks, for 2 day shipping! I bought it on Sunday and had it up and working by Wednesday night!" *"You weren't kidding! Built like a battleship! The heavy copper wire ought to last years! And best of all, it hears better than all my other antennas!" *"Neat idea! Separate wires for each band! and it is receives awesome on all frequencies. The MW performamce really surprised me.Thanks!" *"I love the way this antenna works and I was able to make it fit into my small backyard." *"Thanks, for making such a fine antenna! It out hears every antenna I have up!" The Super Sloper All Band Antenna can be configured in dozens of ways and can be deployed to fit the unique situation at your home location. A few tips on installation will follow, but it is really a "No-Brainer", a true Plug and Play! Attach some nylon cord or wire on the end insulator and stretch it out a support. The eye bolt on the center insulatror can even be attached to nylon cord and a pulley installed at the top of the mast or support to raise and lower the antenna. The old antenna adage "Install as High as Possible" applies for best performance, but adaptations for your unique situation is a common practice. Hams have even been known to bend the ends of a sloper or dipole to get it to fit their yard or supports with very little deterioration of performance. When compared to a commercially made 32 all band vertical sitting over 100 radials in the antenna test field, the Super Sloper All Band outperformed the vertical on long haul signals, like to Europe or Asia, every time! On many occasions the Super Sloper was over 2 S-Units stronger than with the commercially made vertical. The vertical was equal on a few signals closer to the USA, like South America, BUT the vertical never out performed the Super Sloper! Why pay TWICE the price for a commercial antenna similar to this(Alphadelta & Eavesdropper) that you see advertised in the magazines, when the performance and price are better with the Super Sloper All Band Antenna?? Remember, NO LOSSEY TRAPS OR COILS IN THIS ANTENNA, just pure antenna!! Compare the price of this antenna to the two popular ones recommended in Passport, and you will easily see which is the better buy. AND with the Super Sloper you get 50' of coax feedline included FREE!! A Quality Lightening Arrestor can be added to the package for only $15 more, but is optional to buyers!